If you're tired of struggling with debt, or you simply feel like you could handle your money better, Financially Frozen can help you make positive changes with your money. You'll learn why financial goals and a budget are the keys to getting ahead. You'll learn how to improve your credit, get out of debt and protect yourself and your money. Financially Frozen makes your finances easy to understand, so you can stop feeling stuck and start living the life you want. Learn how to define your goals and values. Your values have a big effect on your finances. By figuring out what's most important to you, you can spend and save for the things that will bring you the most satisfaction. You can set financial goals. For example, if you like adventure, you may want to save for a trip overseas. If you value a comfortable home for your family, you might want to save for a remodeling project or a new couch. Learn to develop a budget that can get results. You'll learn to create a budget that really works, because it fits your needs and lifestyle. Your budget will also incorporate your financial goals. You'll be able to see every month how you are working toward your goals. Understand your credit report and credit score. Wherever you are in your financial life, your credit is important. Credit is a financial tool that can benefit you. When you learn to use it carefully, it can enhance your life. Learn about contracts, leases and insurance. Contracts are everywhere; find out what you should know before you sign one. Financially Frozen will help you become an educated consumer. Q.) How will Financially Frozen help me get out of debt? A.) An entire chapter of the book and program is dedicated to telling you the steps to take when you find yourself in financial trouble or need help dealing with your debt. Additionally, you'll learn about your credit report, your credit score, and how to improve and maintain good credit. You'll also learn how to use credit carefully so that it is something that enhances your life, instead of being a problem. Q.) Is this book only for people who have financial problems? I'm doing OK financially, but there are things I could probably improve. A.) 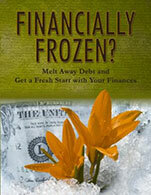 Financially Frozen is for people like you who want to handle their finances better. It's true that this book will help you make a plan to get out of debt and develop better credit. But it will also help you how to set financial goals and use a budget. You'll learn many skills that will help you make wiser, more satisfying choices with your money. Q.) My son is graduating from college soon. Is this book appropriate for him, or is it better for adults who've been in the work force for a while? A.) The information in Financially Frozen is perfect for a college graduate. Although by now, your son likely has a checking account, credit cards, has rented apartments and has taken on student loan debt, there's a lot about being financially savvy that he might not know. Financially Frozen will give him valuable information about contracts, consumer laws, keeping up-to-date files, shopping carefully, and protecting himself from scams. It's information that every adult consumer, of any age, needs to know.